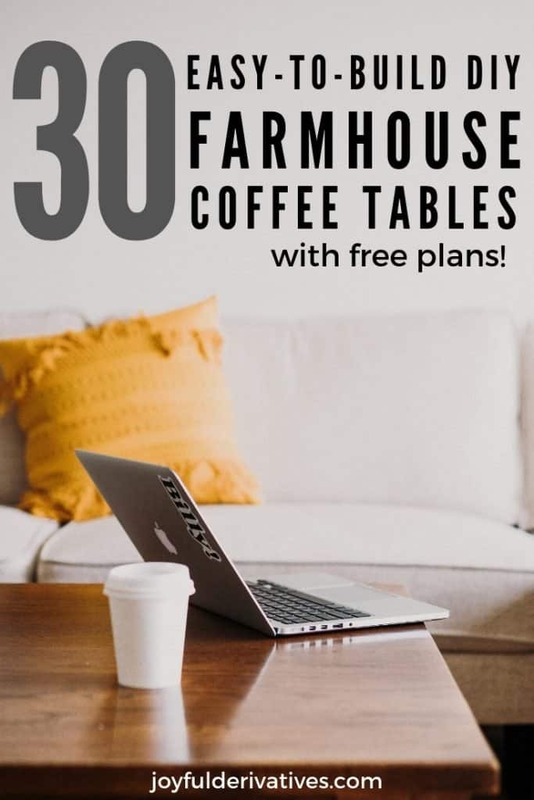 Get inspiration and plans for how to build your very own DIY farmhouse coffee table in this extensive list of projects ideas! 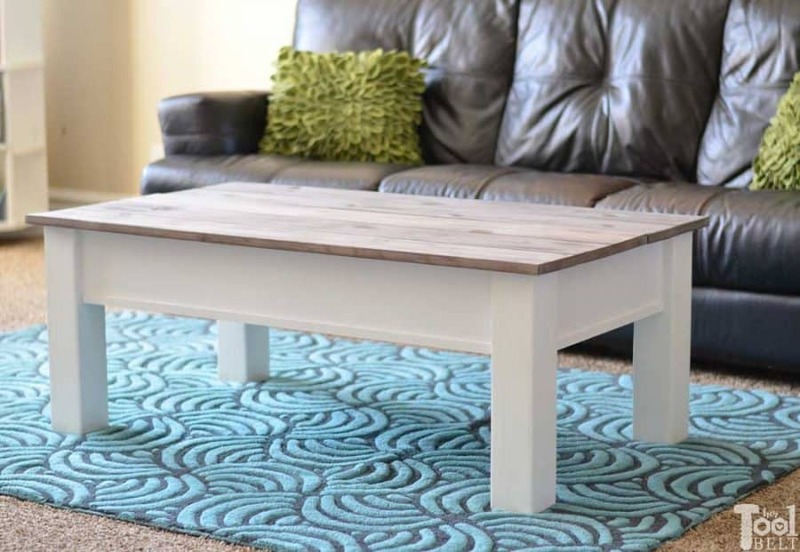 All of these easy tutorials with free plans are step-by-step instructions for making a fabulous coffee table for a fraction of the cost of buying one! 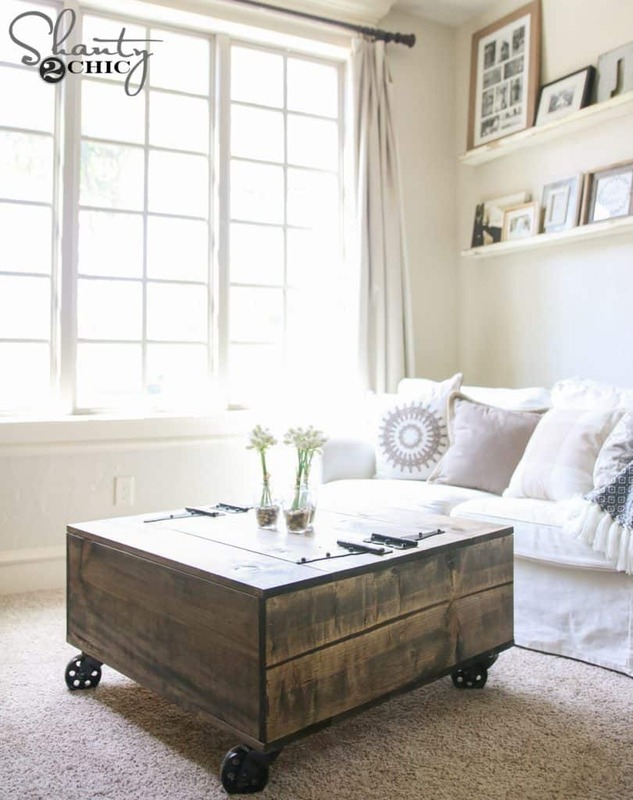 Coffee tables are a fantastic way to add style and function to a living room space. Not only can they be used as a place to display decor or set things down, but they can also often be used for storage and/or a place to put your feet up after a long day! 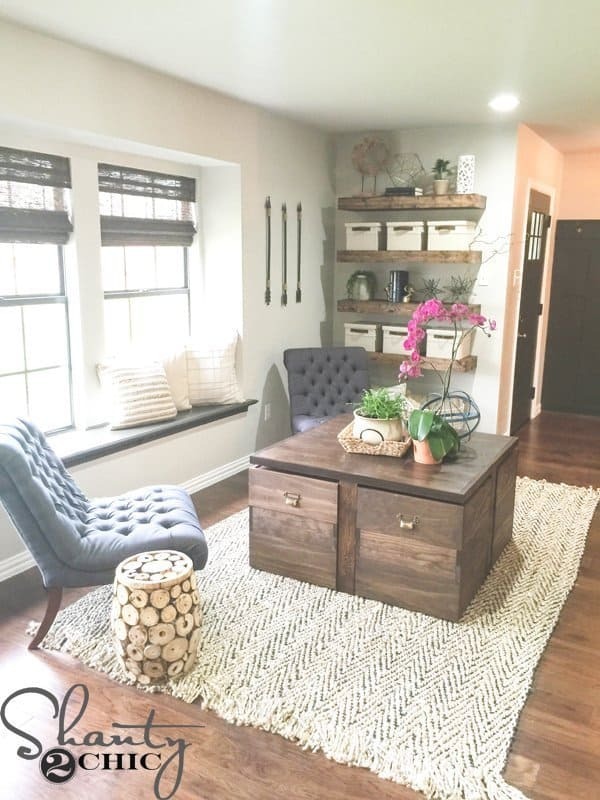 You may have learned this about me already, but one of my favorite hobbies is to make decor or furniture that looks like it came from designer stores like Pottery Barn or West Elm for a fraction of the cost. 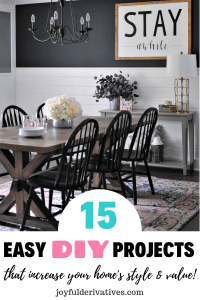 Unfortunately, our current home is too small for a coffee table (we built a table for BEHIND the sofa – you can see that here) so rather than build design and build a table I don’t need, I’ve rounded up 30 fantastic other bloggers’ projects so you can find the perfect tutorial for your space! 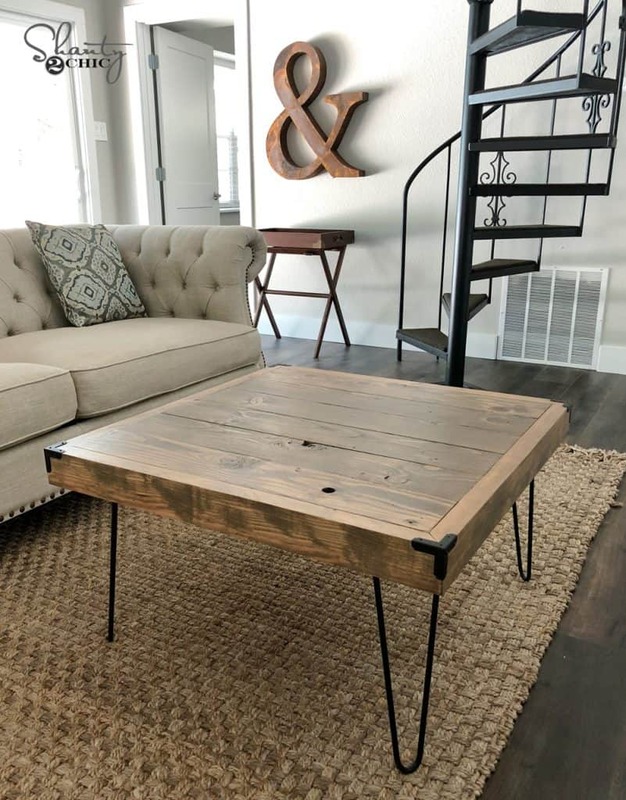 I may someday decide to build a DIY farmhouse coffee table for a friend or family member, but until then, I’m spreading the love by sharing my peers’ ideas. 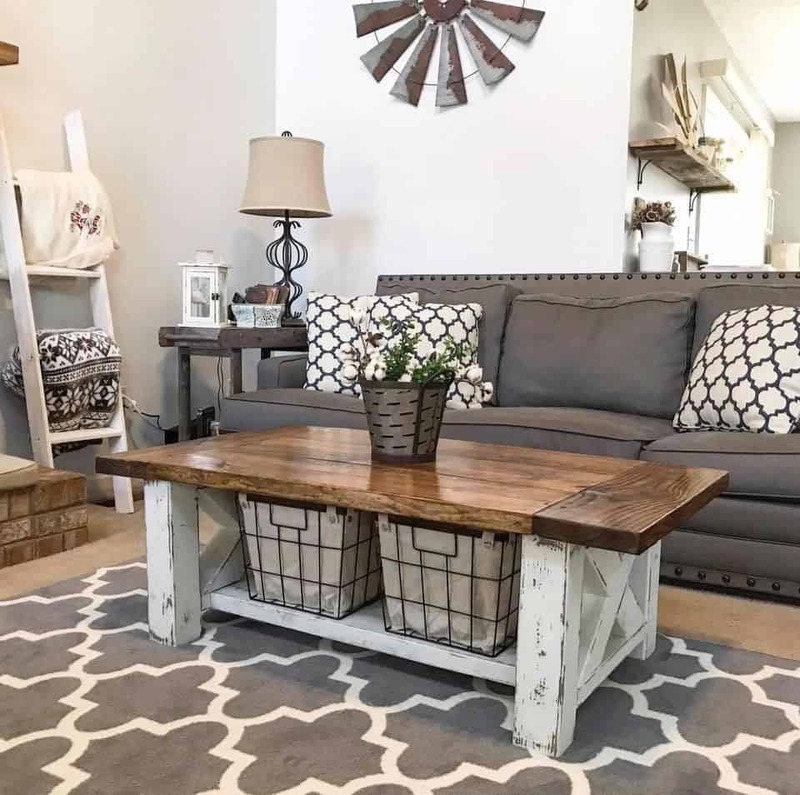 No matter what style of farmhouse you have (modern, rustic, vintage) you should be able to find a coffee table that’s perfect for your room. I’ve even thrown in a few fun ones like a trunk table and puzzle-hiding table! 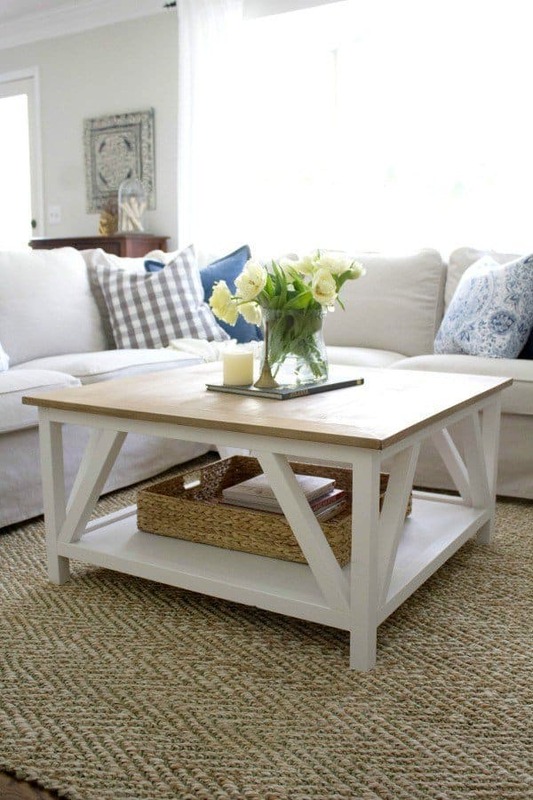 The simplicity of this coffee table is what makes it so beautiful and it’s easily customizable to whatever size fits best in your space! I am in love with the herringbone pattern top on this table! 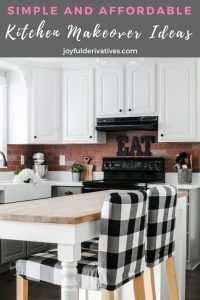 That tiny detail adds a lot of style and takes this DIY farmhouse table from simple to spectacular! 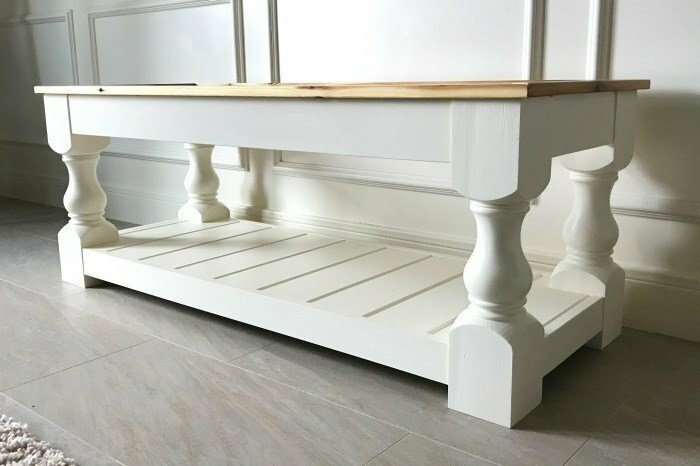 The detailed legs (which didn’t require any modifications) give this table a beautiful, classic farmhouse style. Angela is well-known for her wood staining techniques, and the weathered wood look she achieved on this one does not disappoint! 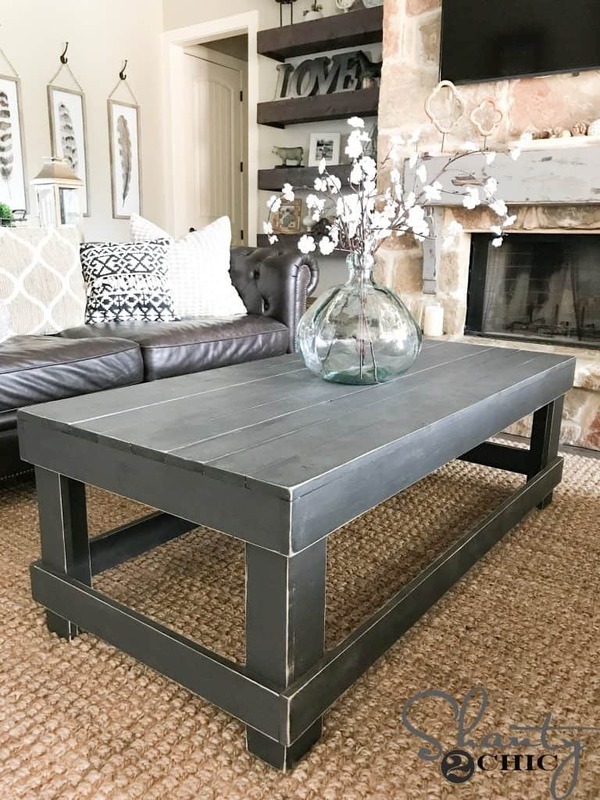 I love the modern farmhouse style of this table with the metal hairpin legs and corner guards. 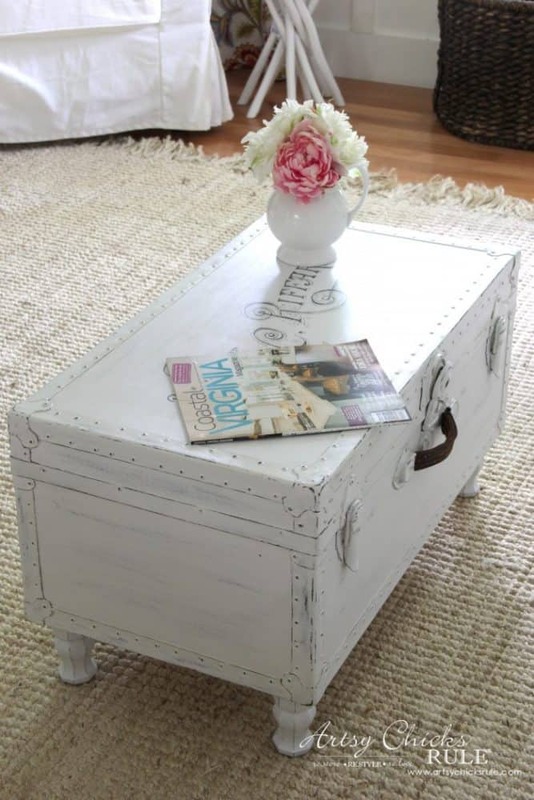 Make it more rustic or farmhouse-y by painting and distressing it! 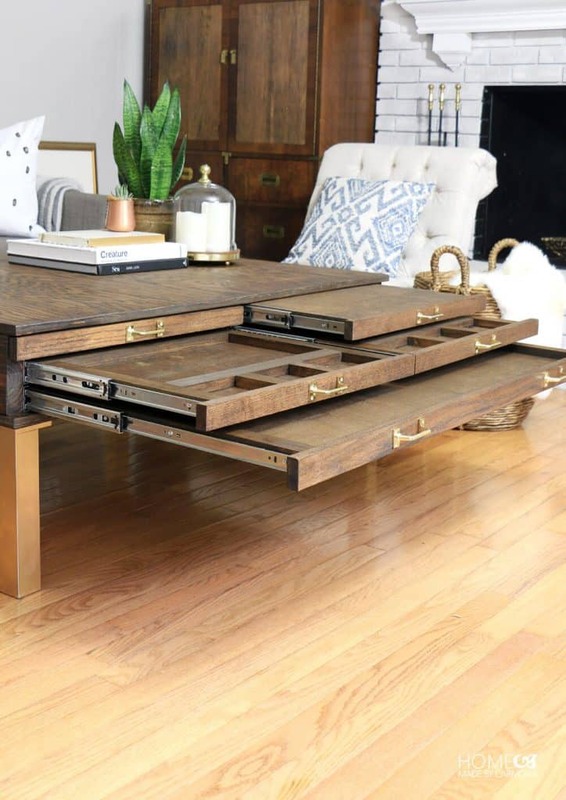 This Restoration Hardware knock-off is stunning and built for a fraction of the cost! Jen teamed up with Ana White to give you simple, easy-to-follow plans for building this one. I like Amanda’s use of the lighter stain on the top of this table. It makes for a warmer farmhouse style and the shelf is nice for storing books and remotes. 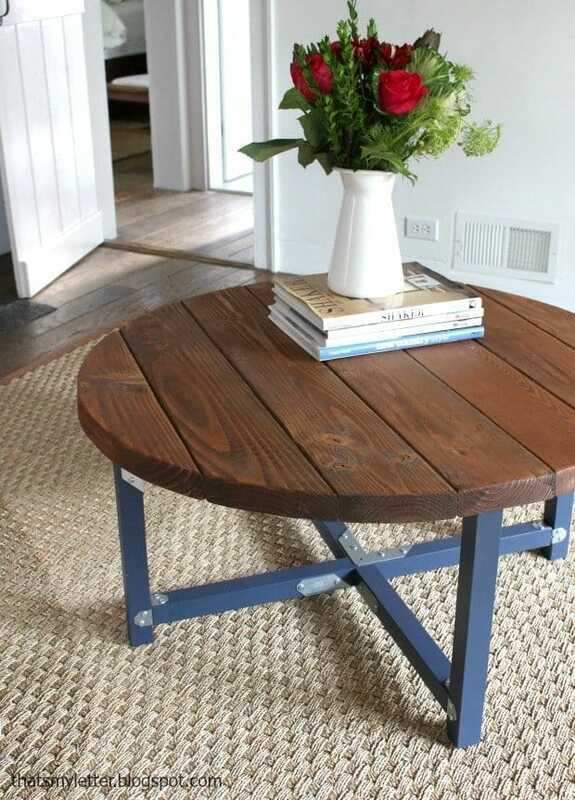 This round coffee table has a fun twist with the blue base and metal braces! Customize it to use your favorite stain, paint and brace colors! 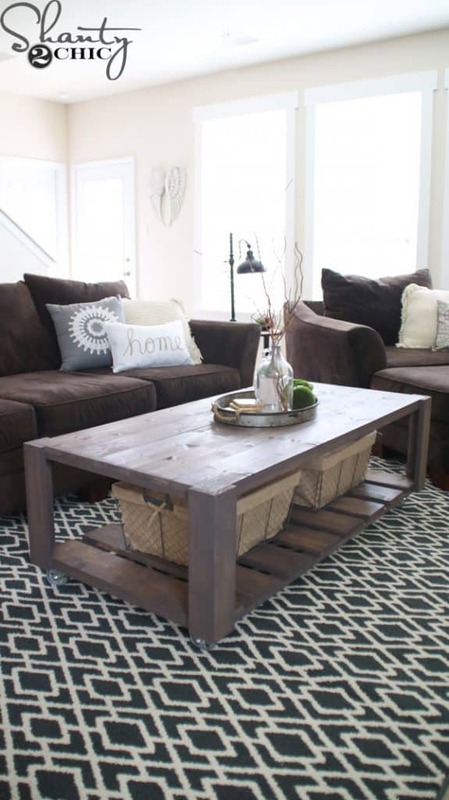 The diagonal placement of the boards on this coffee table give it even more of a modern vibe. I love the fact that it only takes 15 minutes to make, and if it’s too modern for you, try distressing it a bit to make it more rustic. This table’s simplicity is what makes it so desirable. I love the way the imperfect wood on the top makes it feel like a vintage piece. The large legs with metal brackets give this one a slight industrial vibe. Don’t be afraid to place large baskets under whatever table you build! I love the industrial flair of the pipe and the modern style of the small shelf. Try painting the base white for a touch more farmhouse style or stain it darker for more of a modern rustic look. 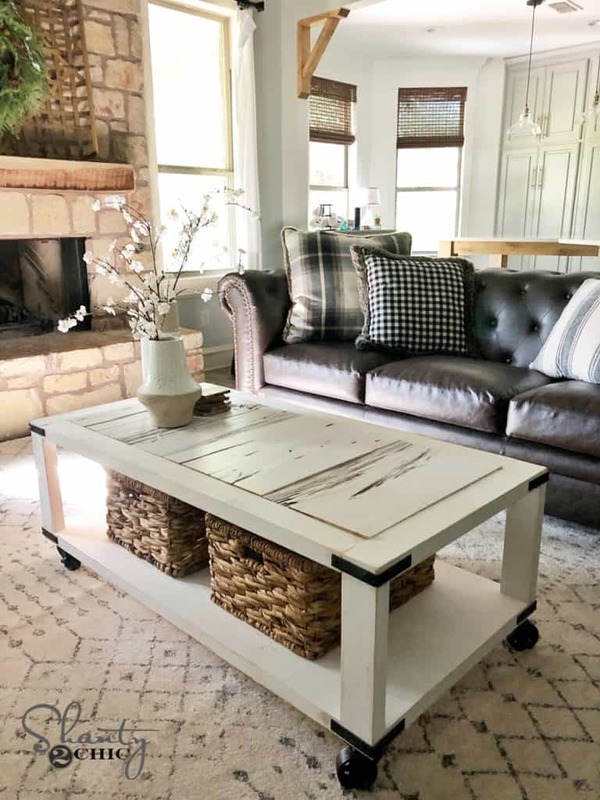 This coffee table can easily be converted into a bench with a simple upholstered top and Stephanie gives you plans and simple steps for building either or both! I love the style that comes from the detailed legs and the slats on the bottom shelf of this one. Dying for a modern hairpin leg coffee table? 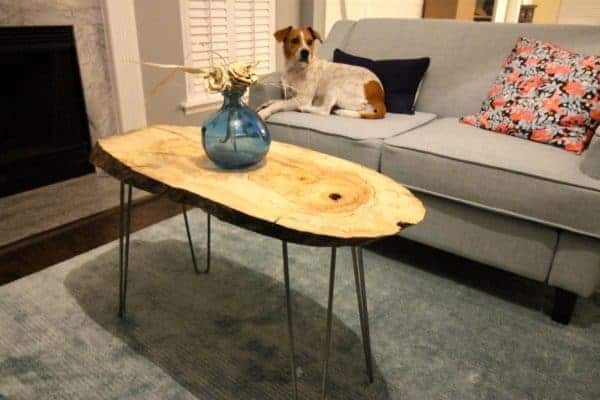 This live edge slab coffee table is a neat idea and super easy to build! Even the wood slab was ordered from Amazon! This chunky farmhouse table is great for large spaces where the chunky legs don’t feel too big. I like how they distressed the legs and gave the top a shiny sealer! 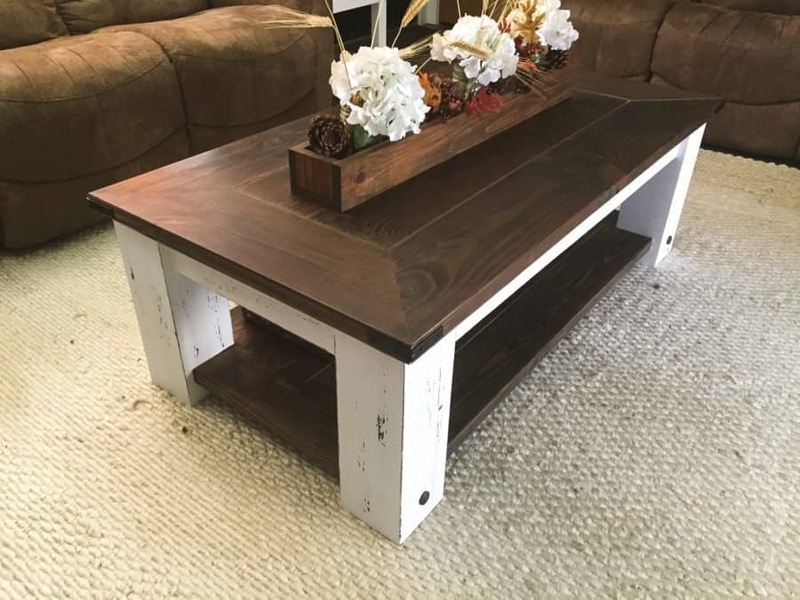 Add a little reclaimed wood to the top and this one takes on a whole new rustic style! I love the texture of the barn wood and the addition of casters and metal corner guards add perfect industrial touches. I love this project from Ana White and her DIY coffee table plans are super easy to follow. This table honestly reminds me of something you’d get at Pottery Barn! I love the mitered corners pieces on the top of this table. The legs are quite chunky, so be sure you’re putting it in a larger room where it doesn’t feel too bulky. 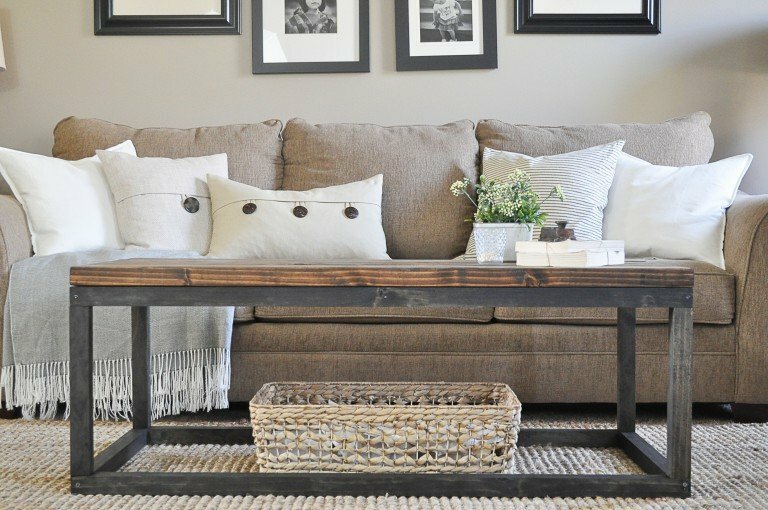 This rustic coffee table DIY project is perfect for the beginner because it only takes two tools to build it! I love the straight lines and the wrap around the base – plus, you could paint it any color that matches your decor best. 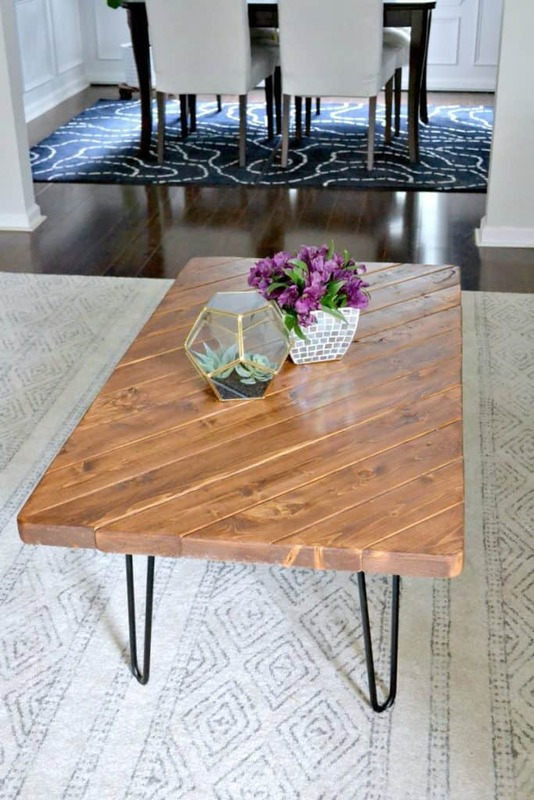 For under $75, Ashley shows you how to mimic the metal based industrial coffee tables and build this stunning table! Placing a basket underneath allows for some storage too. This is an easy build for a beginning DIY’er and the dark colored finish is a unique style. 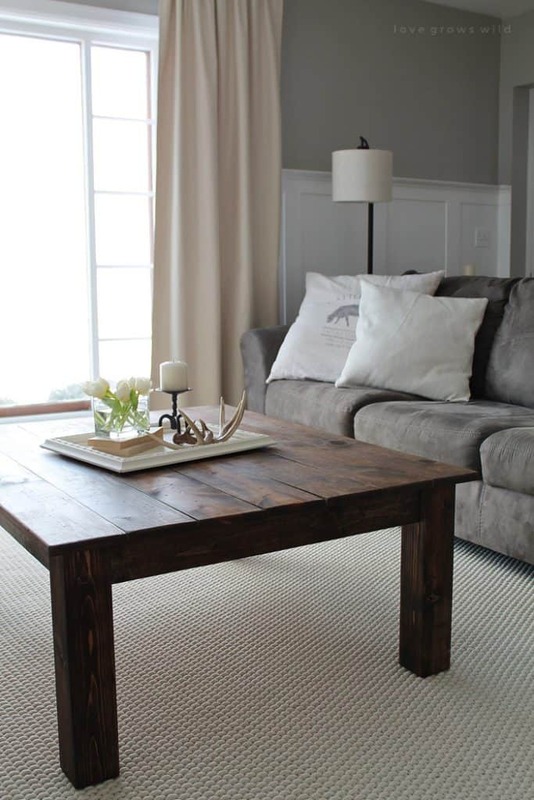 Shelly modified the Ana White plans to create a rustic, weathered grey coffee table – perfect for a coastal farmhouse! 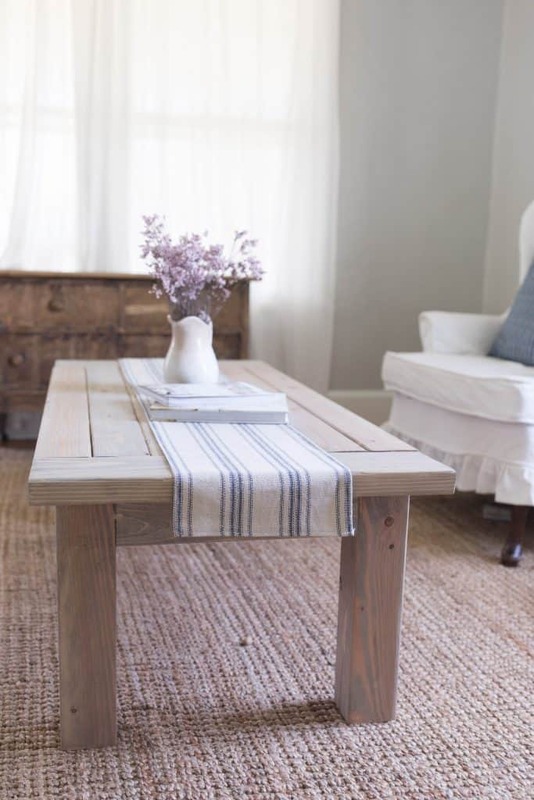 Buy an inexpensive IKEA coffee table and add turn it farmhouse by adding simple planks on top! 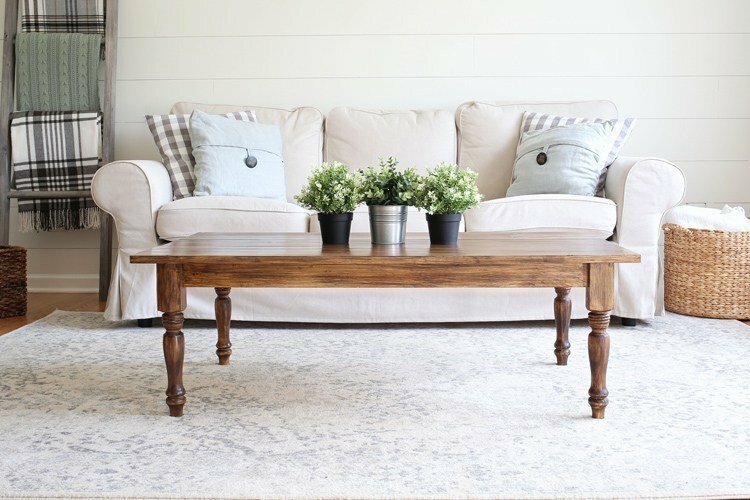 This tutorial is extremely easy and will add some beautiful farmhouse style to your home. 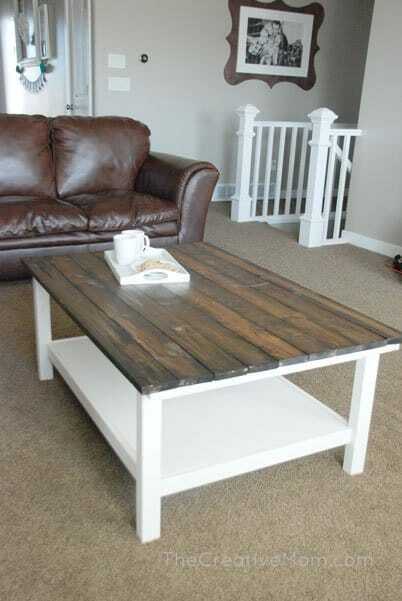 This DIY farmhouse coffee table is great for storage. The stylish crate-style shelf underneath is designed to hold large baskets that are perfect for storing anything from blankets to games. 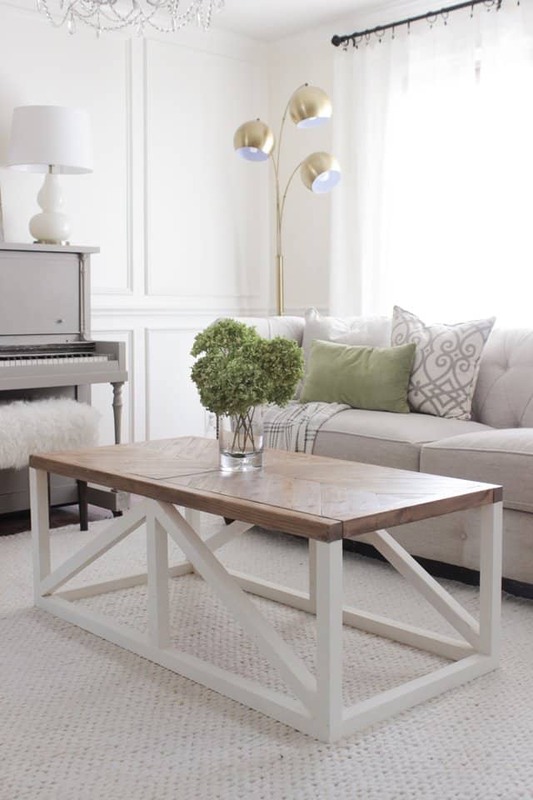 Plus, having this large coffee table on casters makes it super functional too! This table has so many functionalities! I love that you can use it for a puzzle, for games, for extra serving space, even crafting! Not only that, but this table is STUNNING. 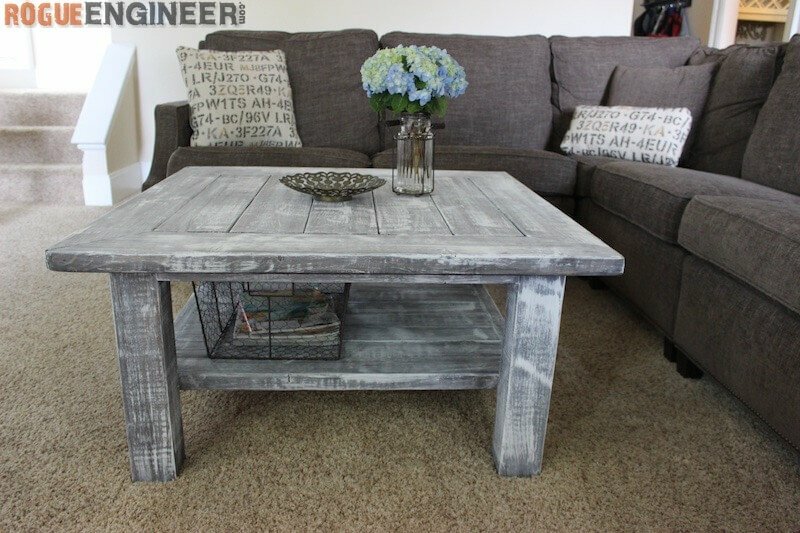 Love this idea for a DIY coffee table! 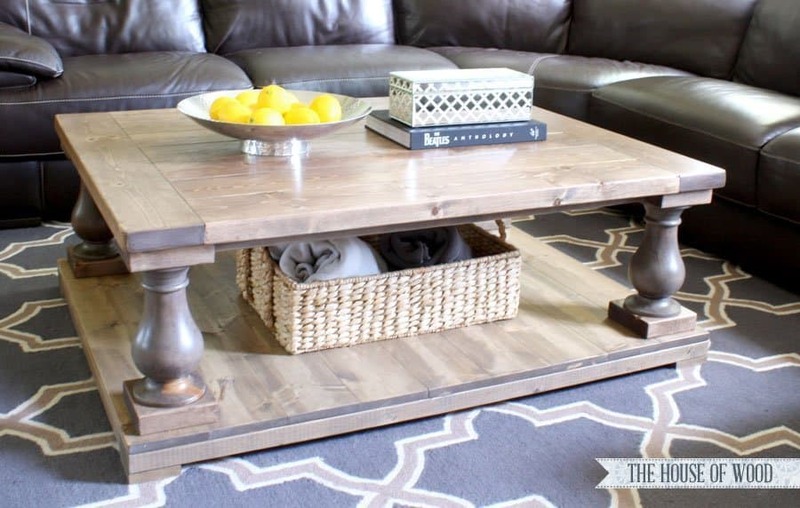 I’ve always wanted to build a DIY coffee table with hidden storage! And this one not only has great plans, but it’s super stylish and easy to build too. What a creative storage solution for a puzzle! 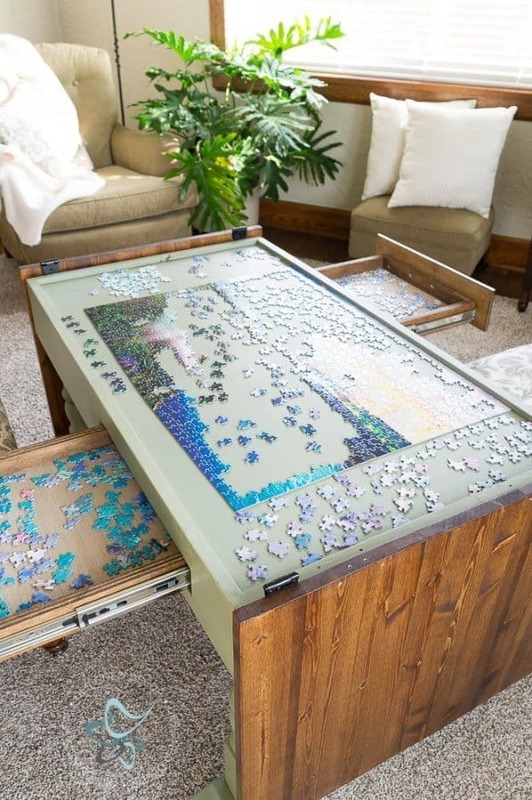 We always run into issues with our puzzle taking up our dining room table and I love the idea of being able to hide it away. 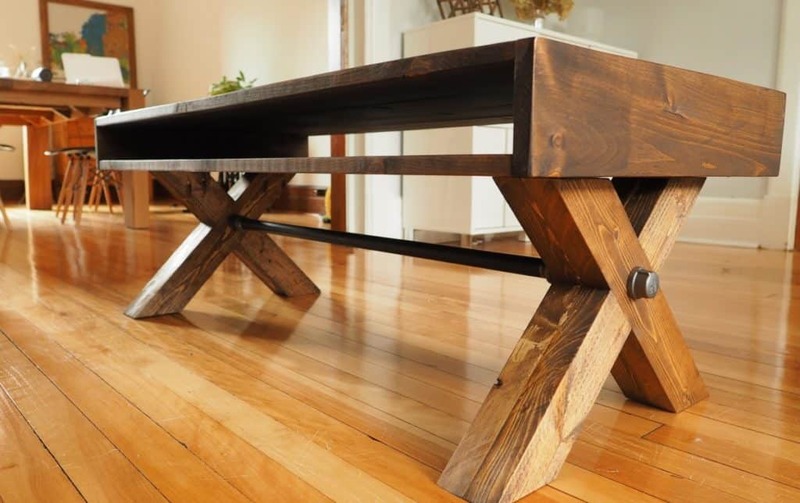 These plans use reclaimed table legs and the table can be painted any color to match your decor. 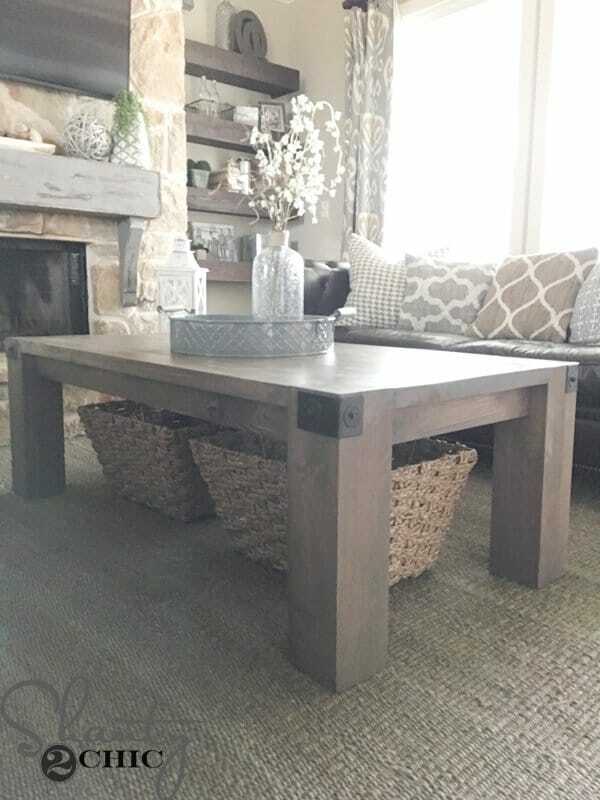 With the addition of metal castors and hinges, this farmhouse style coffee table is both stylish and functional. The hinge-top makes storing items inside of it a breeze! This Pottery Barn knock-off is a great option if you want more of the sophisticated farmhouse style and the drawers add major function. Make it a bit more rustic by distressing it some. 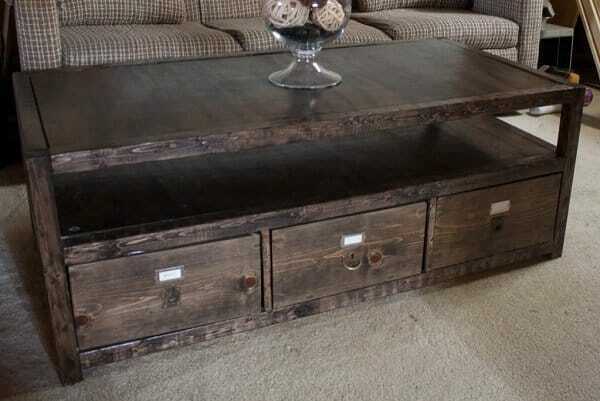 What a creative DIY coffee table with storage! I love the french country farmhouse style and this one was only $5 to make. 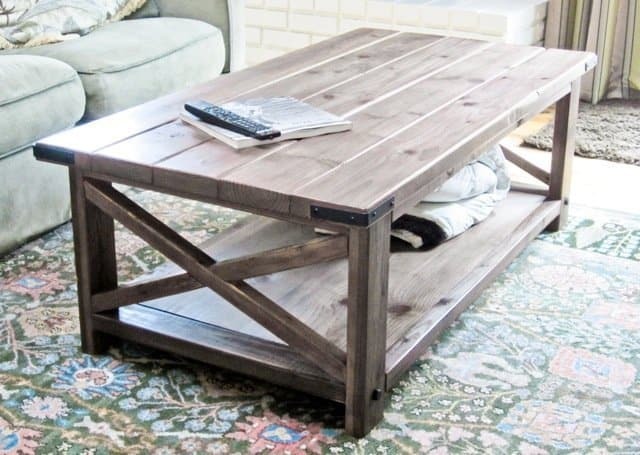 This large, multi-purpose coffee table can store all sorts of things and also serves as an ottoman! Well, there you have it! All sorts of options for you to choose from. Which one looks like the best fit for your design and budget? I’d love to hear which one you build in the comments! « How to Make a Tulle Canopy your Kid will Love!